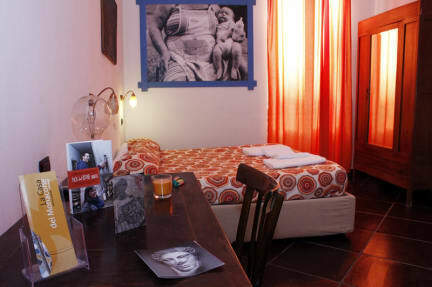 The “Casa del Monacone” is much more than a B&B: made out of the convent connected to the Basilica of Santa Maria della Sanità, it’s now become a hospitality project, managed by the social cooperative “La Paranza”. Six bedrooms with private bathrooms, a big terrace and a common living room create a cozy and welcoming environment that manage to keep the old warmth of the place. 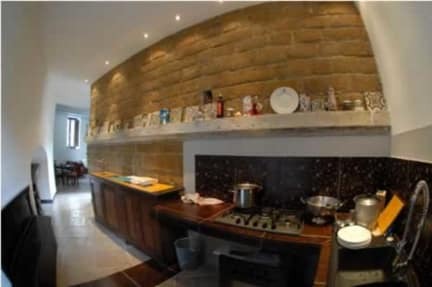 The “Casa del Monacone” is located in the main square of Rione Sanità, just few minutes away from the historic center of Naples and very few steps far from the many cultural and artistic attraction that the area has to offer. We are in the heart of Sanità, few steps away from the historic center of Naples. In few minutes you can reach the metro line 1 and 2, the Capodimonte Museum and the National Archaeological Museum. The spaces of the ancient convent in the heart of Sanità have been designed and re-arranged by Neapolitan designer Riccardo Dalisi, in collaboration with the young people of the cooperative La Paranza. Six warm and welcoming rooms, carefully furnished and enriched by precious details, have been made out of the areas that once hosted the friars. The majolica tiles have been designed by master Dalisi and hand-made; the big tiles are about 3 cm thick. The appliques (wall lights) in the rooms, moreover, have been handcrafted by the creative laboratory Iron Angels.